Hot Tar Roof Repair or Replacement? Making a minor hot tar roof repair can be economical when it sustains damage from intense weather or impact. But the older a roof gets, the more likely you’re creating a money pit of continual patchwork and leaking issues. Here is some information that can help you make an informed decision about when it’s time to stop making small fixes and get a new roof. 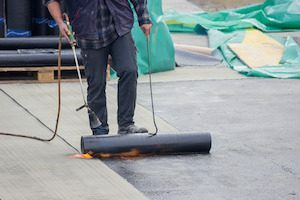 ● Exposed Intermat: When the asphalt that secures the gravel wears away, it can expose the intermat below. This opens the roof to water seepage and can be recoated and sealed. ● Damaged Areas: Fluctuating temperatures, falling objects or just walking on the roof can cause damage. Isolated problems may be manageable for a flat roof professional. ● Rising Nails: When nails aren’t fully driven in, they can protrude over time. This may require a simple repair or be the symptom of a larger problem. ● Improper Flashing: It’s common that flashing isn’t properly sealed and allows water penetration. Fortunately, this is generally a minor repair. The classic hot tar and gravel roof enjoys at least three layers of waterproof material with hot material inserted at each level. When properly installed, they are strong and generally last 20-25 years. That’s an important piece of information to have on file because that could be the key to making the call between hot tar roof repair and replacement. When areas begin to fail around skylights and pipe penetrations, the gut reaction to patch and repair may be fine for young roofs. But in roofs that have logged a few too many years, you’re likely to see other leaks occur. There’s a tendency for one quick fix to lead on to another and another. That’s the “money pit” syndrome, and it can be frustrating and financially draining. If your roof is over 20 years old, it’s important to get a complete assessment from a hot tar roof repair and replacement professional. If you are experiencing leaks or want to be proactive about flat roof maintenance and replacement, contact Montgomery Contractors for a free estimate.